Tenuta Parco dei Monaci (Monks Park) is an ancient estate south of Matera dominated by a powerful, fortified complex of the 11th century. The area falls on the Murgia plateau where the only lands that can be plowed are small terraces on naked limestone. In the XV century the Angevins brought here their vines to produce wine for the French court in Naples. In 1532, through a testamentary donation, the property came to the Benedectine Monks and took its current name. In the second half of the XVIII century the Monks planted a vineyard of Primitivo (a.k.a. Zinfandel) grapes that, thanks to its qualities, soon extended to the entire plateau down to the coast. In 2005, with the introduction of the Matera DOC regulation, it becomes possible to bring back to life these great wines of the past. Tenuta Parco dei Monaci was established on a particularly suited terroir in 2007, with a high quality target. That setting had already been chosen by forebears centuries beforehand. The soil is very old, black and stony. Just a meter deep, it lays on tufa, a soft limestone. This rock habitat, wind-blown day and night, is an unspoiled landscape of great beauty. The spouses Rosa Padula e Matteo Trabacca put together all their expertise, passion and courage to bring back to life the family tradition of winemaking, lost in time past. Grandfather Francesco S. Padula was born in 1907, one hundred years before the DOC “Matera” regulation. 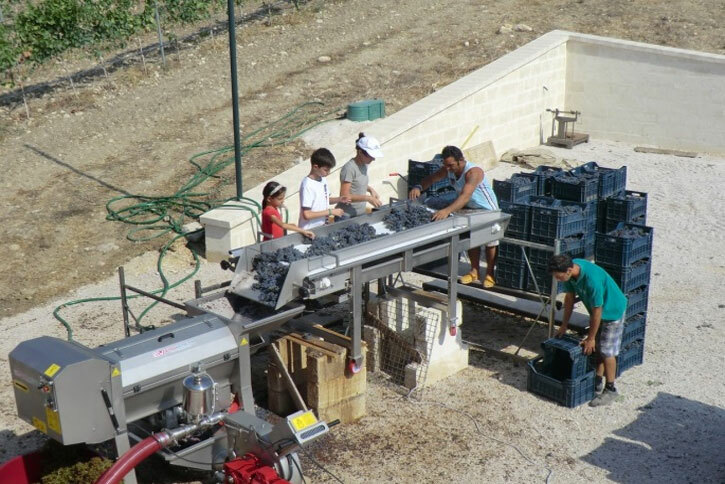 As a farmer he had his vineyard of Primitivo grapes, and he used to age his red wine in Matera’s caves. At the end of ‘900 died Mario Trabacca. A visionary father who dreamed of pruning vines.